It's December, and that means it's time for a Christmas edition of Food 'n Flix, where, along with a talented group of bloggers, I create a recipe inspired by a chosen film. 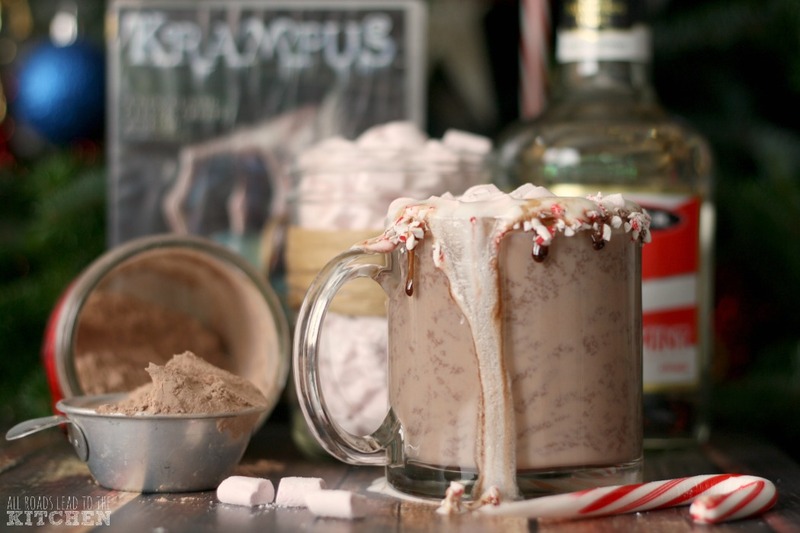 Since I'm hosting this month, I created the challenge, asking everybody to create a recipe inspired by the 2015 horror-comedy, Krampus! I was under the influence. All I had to eat was fudge and candy canes. As I mentioned in my announcement post, in the folklore of Germany, Austria, and many Central European states, St. Nicholas and Krampus were partners. On the eve of St. Nicholas Day the two would work together, St. Nicholas would fill the boots of the good children with fruits, sweets or other treats, and Krampus would kidnap the naughty children, often beating them, and drag them away from their homes. Krampus wore chains and bells, and was said to have the cloven hooves and horns of a goat, with a long, barbed tongue. In this movie, instead of St. Nick, Krampus is accompanied by his evil minions, which include gingerbread men, elves, and animated toys (which I suppose could be considered kind of horrifying...were it not so campy). He is summoned when, after being teased relentlessly by his cousins, young Max rips up his letter the Santa and turns his back on Christmas. In true National Lampoon's Christmas Vacation style, the blue-collar, extended family arrives at the Engel's front door a couple of days before Christmas. The bickering family winds up getting trapped in the house without power when a vicious storm blows in unexpectedly. It turns out this storm is a more than it appears at first glance. Where's the nog? I need to get merry. Krampus and his crew terrorize this family, which in turn opens their eyes to the way they've been acting and treating each others, by requiring them to work together to save the ones they love. The movie closes with a reminder that Krampus is always watching. As far as food goes, I actually found quite a bit of Christmas-type inspiration. A bucket of bulk cookies and giant candy canes in the mall, a magnificent spread of homemade cookies, gingerbread, and fruitcake, mention of fudge, Scotch, a macaroni and cheese with hotdogs casserole, gravlax, mention of egg nog and a holiday roast, turkey (or maybe it was cornish hens), crème brûlée, beer, a mention of a "noodle incident", mention of cheese, hot chocolate, gingerbread men, elk or reindeer, goat (Krampus), peppermint schnapps, loaves of bread, a gingerbread house, mention of a sugar plum, and pancakes (chocolate chip, I think). 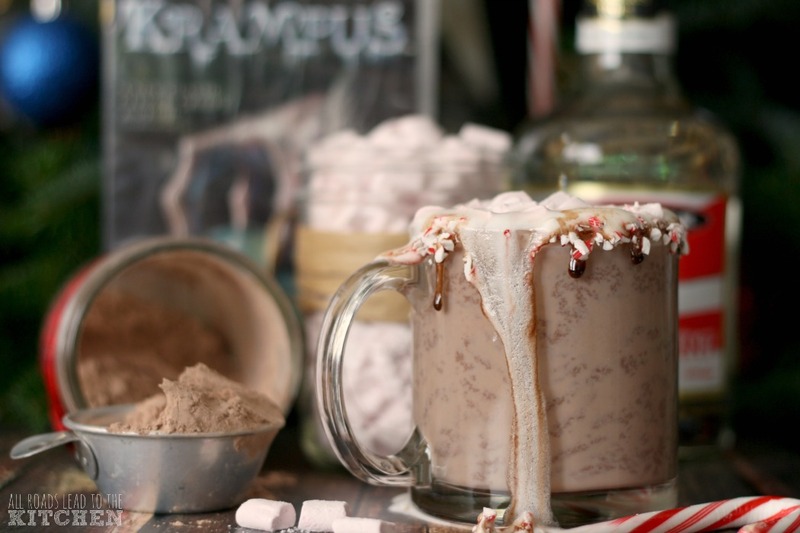 Ultimately, I chose hot chocolate and peppermint schnapps as my inspiration this month. Omi made some rich-looking hot chocolate in the fireplace while the power was out, and Aunt Dorothy taught the kids how to make it even better by pouring adding schnapps to it. I thought the only way that I could improve on that was to make homemade marshmallows...peppermint marshmallows. 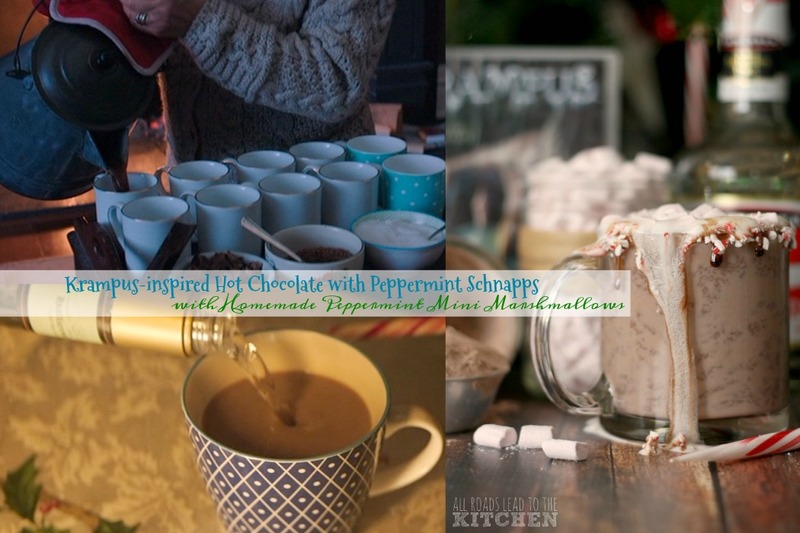 The recipe for the marshmallows is below, but to make the hot chocolate, I used my homemade hot cocoa mix. While the milk is heating up, I just dipped the rim in a little chocolate syrup, and then some crushed candy canes. If you want it "Aunt Dorothy style", add a shot of Peppermint Schnapps to the glass before pouring in your hot chocolate. Top it with a dollop of whipped cream and a handful of mini marshmallows. By the time you reach the bottom of the mug, you'll be asking—Krampus who? I'm hosting this month's edition of Food 'n Flix with my pick, Krampus; submissions are due 12/23. Join us next month as we head into the kitchen with one of my favorite rom-coms, French Kiss. I'll be hosting over at home base, aka the Food 'n Flix Club site! 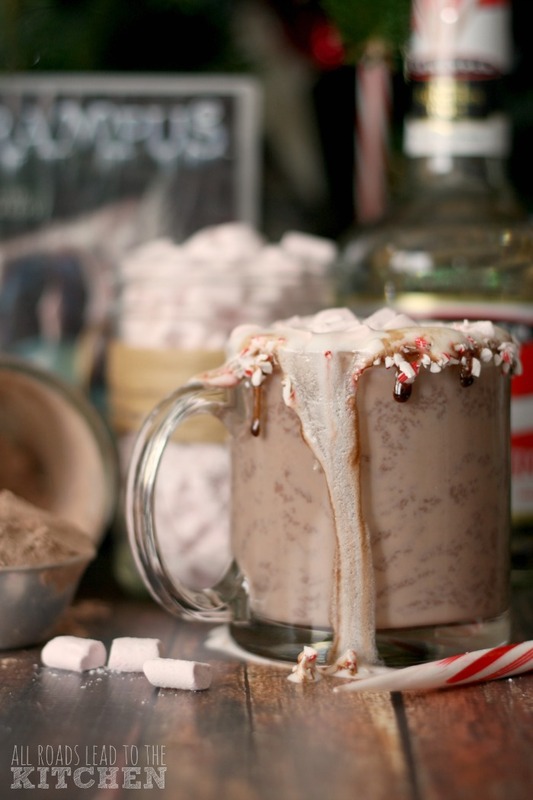 Jazz up your cup of winter hot cocoa with these homemade peppermint mini marshmallows! Place the gelatin and 1/2 cup of the cold water in the bowl of a stand mixer fitted with whisk attachment. In a medium saucepan, combine the remaining 1/2 cup water, sugar, corn syrup and salt. Set over medium-high heat, cover and allow to cook for 3-4 minutes. Uncover, clip a candy thermometer onto the side of the pan and cook until the mixture reaches 240° F, 6-8 minutes. Immediately remove from heat. Turn the mixer on low and, while running, slowly pour the sugar syrup down the side of the bowl until all of it has been added. Increase mixer speed to high and continue to whip until it becomes very thick and has cooled to lukewarm, 12-15 minutes. 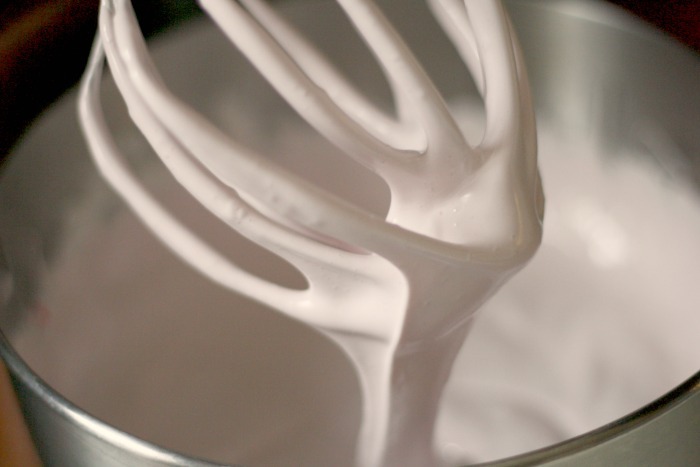 Add the peppermint extract and food coloring (if using) during the last minute of whipping. While the mixture is being whipped, insert a piping tip with a 1/2-inch wide plain circle opening into an 18-inch pastry bag. Fold back the tip of your pastry bag and set it in a wide-mouth quart-sized jar. Fold down 2-inches at the top of the bag and lightly oil the inside. Combine the powdered sugar and cornstarch in a small bowl or baggie. Line 4 baking sheets with parchment paper and lightly oil or spray the paper with nonstick cooking spray. 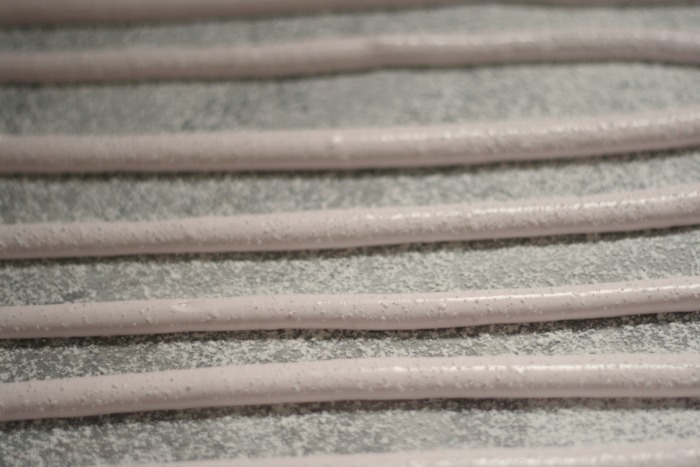 Use a sifting wand or a mini wire-mesh strainer to dust each one with a light coating of the powdered sugar mixture. Working VERY quickly, use an oiled rubber spatula to scrape the whole mass into your prepared piping bag. Pipe the mixture into long rows onto the prepared baking sheet, leaving about an inch of space between each strip (about 10 rows per sheet). Sprinkle the tops with enough of the cornstarch and sugar mixture to lightly cover. Let the strips sit, uncovered at room temperature, for 2 hours. 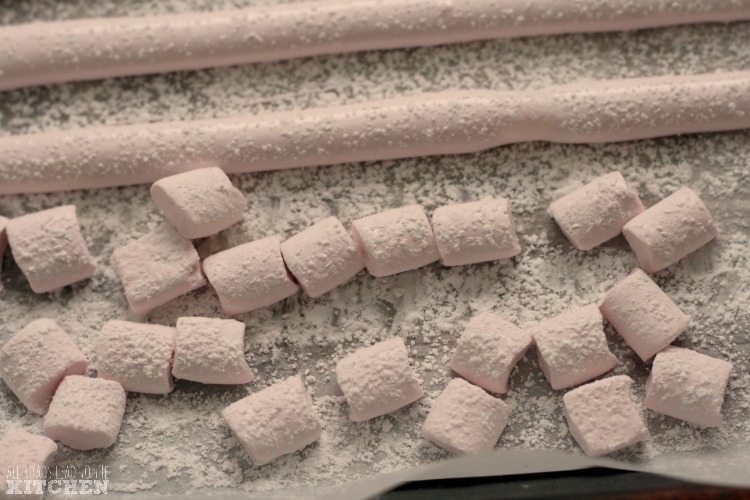 Using kitchen shears dusted with the powdered sugar mixture, cut each strip into 1/2-inch mini marshmallows. 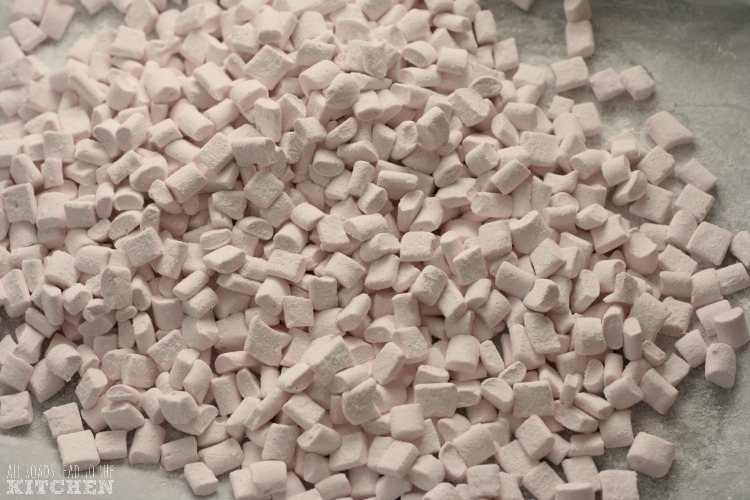 Once cut, lightly dust all sides of each marshmallow with the sugar mixture. Boozy Peppermint Mini Marshmallows (Peppermint Schnapps Mini Marshmallows) - Use 1/2 cup of Peppermint Schnapps in place of the 1/2 cup of water in the first step (combining with gelatin). Omit peppermint extract. 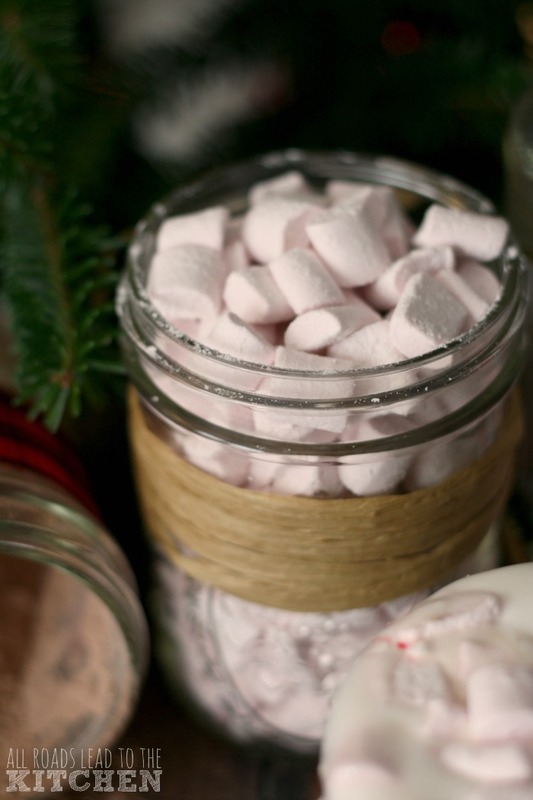 Regular Mini Marshmallows - replace the peppermint extract with pure vanilla extract. ©All Roads Lead to the Kitchen. Adapted from Alton Brown.